Before meeting its end in a planet-circling dust storm, the Opportunity rover traversed nearly 30 miles over the perilous Martian surface. In some ways, we traveled along with Oppy thanks to the thousands of images it sent back to Earth. But what did Oppy’s journey sound like? 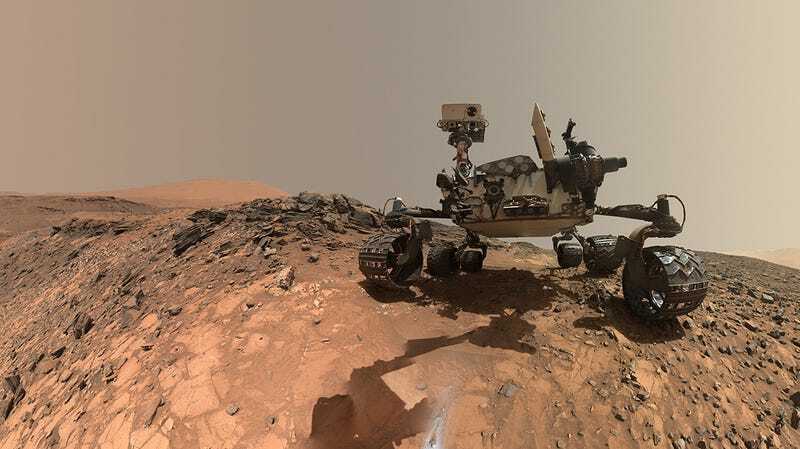 There weren’t microphones transmitting sounds the sounds of Opportunity or its partner, Spirit, but surely they must have kicked up a ruckus as their wheels ground over rocks and dry dust. Luckily for the curious among us, however, NASA’s Jet Propulsion Laboratory in Pasadena, California has rover testbeds, including a large area designed to recreate Mars’ surface called the MarsYard. There, engineering models of rovers traverse the model terrain. Together with the science of sound, we can figure out what the rovers sounded like, both on Earth and on Mars. Opportunity’s cleated metal wheels, each with their own motor rolling 2 inches per second over Martian rock, created the exact crackling sound you’d expect from a metal-wheeled robot rolling over dirt. Meanwhile, the larger Curiosity rover presents an utter cacophony of screeches as its own metal wheels traverse the rocks of the MarsYard. Testing elements of NASA’s Mars Science Laboratory Curiosity rover. But there’s a “pretty big difference” in the way sound travels through the air on Mars compared to Earth, Don Banfield, principal research scientist at the Cornell Center for Astrophysics and Planetary Science, told Gizmodo. Sound is just our brains translating vibrations in air molecules into more meaningful data, but how the sound travels is dependent on the air it travels through. Mars’ atmosphere is mostly composed of carbon dioxide, and is around 1 percent the thickness of Earth’s atmosphere, which is of 78 percent nitrogen, 21 percent oxygen, and a trace amount of other stuff. The difference in the component molecules’ structures and the thickness of the air would produce two noticeable distortions to sounds once you’re a few feet away from the rovers, Banfield explained. There aren’t enough molecules to carry the highest-frequency sounds—the ones with the shortest wavelengths—so at farther distances you wouldn’t hear sound with frequencies higher than 10,000 Hz, the pitches that give cymbals and bells their brilliant quality. On the other end, the lower bass tones with frequencies around 100 Hz disappear on Mars, as some energy that would otherwise cause the wave to move forward instead is spent making the carbon dioxide molecules rotate. Additionally, you’re not just standing on Mars in shorts and a t-shirt—you’d be bearing the winds, low-pressure atmosphere, and cold temperatures in a spacesuit. The sounds would be a bit more muffled.